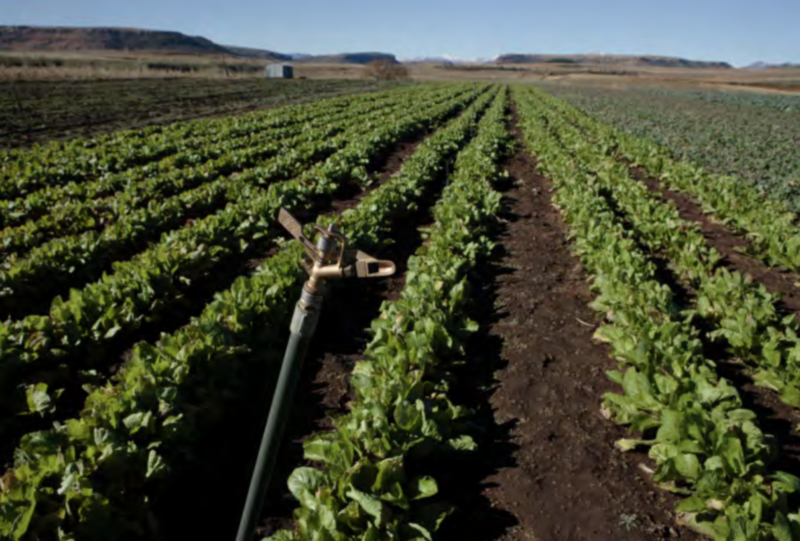 Most of Lesotho's agriculture is rainfed, with low productivity. Another 12,000 ha of irrigated land could boost production by as much as 50%. Photo provided by: John Hogg / World Bank / Flickr. Lesotho has to maintain its water security for domestic, urban and agricultural use through its Lesotho Lowlands Water Supply Scheme. Urban centres in South Africa are reliant on water transfers from the Orange-Senqu River in Lesotho. This analysis looks at the need to ensure continued development of water resources within Lesotho and aims to empower stakeholders to act with more confidence by demonstrating that the implementation strategies can provide benefits to water resources management over a broad range of possible future scenarios. The benefit of using a water planning model - WEAP (Water Evaluation And Planning), with historic climate data and future scenarios, is highlighted as it can be used to help Lesotho and other governments account for risks to water resources associated with climate change. Modelling results will inform investment in infrastructure so that overall development will be resilient to multiple future scenarios. Understanding the sensitivity of water resources originating in the Orange-Senqu River basin in Lesotho to climate change is vital to addressing future resilience of water supply of urban centres in Southern Africa and Lesotho itself. Water is one of Lesotho’s most valuable resources. As a result of the country’s water-rich highlands, the water sector generates 8% to 10% of the nation’s Gross Domestic Product (GDP). One of Africa’s most economically important rivers, the Orange-Senqu River, begins in the highlands of Lesotho and flows for more than 2,300 kilometres across South Africa and Botswana. Lesotho’s altitude, water quantity, and its proximity to demand centres in southern Africa have enabled it to generate revenues through regional transfer schemes. One example of this is the Lesotho Highlands Water Project (LHWP), a multi-phase and binational infrastructure project between South Africa and Lesotho. It enables the transfer of Orange-Senqu River water from Lesotho to Gauteng, South Africa, through a series of dams, tunnels and associated infrastructure. It also provides opportunities to supply electricity to Lesotho through associated hydropower development. In contrast, the Lesotho Lowlands Water Supply Scheme (LLWSS) was created to ensure access for all households to clean water, and to meet national agricultural, industrial and commercial demands for water. The Metolong Dam and Water Supply Program, the first project to be implemented under the LLWSS, has provided a more secure water supply to Maseru, the capital, and to several surrounding towns. The Stockholm Environment Institute (SEI) and the World Bank Group conducted an assessment of Lesotho’s water management system to explore the important role that water plays for the socio-economic and climatic future of Lesotho, and to analyse possible vulnerabilities of its macro-economic development through to 2050 (World Bank, 2016; Huber Lee et al., 2016). The aims of the project were to enable the government of Lesotho to better account for risks to water resources associated with climate change, and to help to ensure that investments in infrastructure and overall development will be resilient to future shocks. Lesotho is vulnerable to the impacts associated with regular and recurrent floods and droughts, and large natural climatic variations. The country’s agriculture is almost entirely rain fed and thus, highly vulnerable to changes in precipitation. Agricultural productivity is low and declining, in part due to the effects of climatic variability. Lesotho is highly dependent on its water resources to ensure continued water transfers and exports, but also to improve domestic levels of access, and enhance economic growth to eradicate extreme poverty. Increases in the urban population and commercial activity will place even greater stress on the demand for water resources and supply facilities. Using climate information was an explicit priority of the LHWP. Its focus was to explore the implications of climate change for different water infrastructure investments being considered by policymakers. To achieve this, climate, hydrological, and water management systems were considered together. One hundred and twenty-one future climate scenarios were modelled using climate information, which primarily took into account surface temperature and precipitation changes. Three infrastructure development pathways were then compared across these scenarios. In the face of making large, infrastructure decisions, the government of Lesotho can use these climate information-based findings to better account for water resource risks associated with a changing climate. Workers at the Shining Century textile company in Maseru. requires a large amount of water. This analysis quantifies a range of possible future conditions to demonstrate the benefits that can be realized over a broad range of possible future outcomes. SEI used the WEAP methodology to conduct an analysis of the performance of Lesotho’s water management system and to find adaptation strategies across a range of potential future climatic models. The Lesotho WEAP model was developed through an iterative series of workshops with key stakeholders from various governmental departments. Different adaptation options, which were identified in close consultation with stakeholders, national experts and policymakers were then analysed against the range of climate models to find out which future option(s) would achieve the most robust performance. First, the assessment analysed the possible scenarios if no further infrastructure was developed. All of the future scenarios show that the demands of urban domestic and industrial sectors in Lesotho, and demands from South Africa would not be reliably met. Meeting water delivery commitments to South Africa would also become increasingly difficult over time in the absence of further development of the Lesotho Highlands Water Project, and with demand increasing significantly after 2025. In addition to the baseline strategy, four other water-infrastructure and water prioritisation strategies were considered. The construction of the Polihali Dam under Phase 2 of the LHWP. The full development of all future phases of the LHWP (including the Polihali Dam). The full development of both the highlands and lowlands projects. The full development of both the highlands and lowlands projects, with the development of irrigation to support 12,000 hectares of agricultural production. The development of the Polihali Dam, the lowland project, plus the development of irrigation to support 12,000 hectares of agricultural production. By exploring the role of water and energy in the face of uncertainty related to climate change, this project relates to SDG 13. The project’s contribution to the development of hydropower in Lesotho addresses SDG 7 in ensuring access to affordable, reliable, sustainable and modern energy for all. Through the water transferred within the Orange-Senqu River Basin and the series of dams, tunnels and associated infrastructure developed alongside electricity supply, the project aims to build a resilient and sustainable infrastructure - goals in line with SDG 9. The challenge is to balance the opportunities afforded by the highlands project with the need to secure water for domestic, agricultural, industrial and commercial use, particularly in the face of uncertainties related to climate change. These interconnected issues have profound implications for the structure of the economy and future development. To achieve the governments goal of 100% access to clean water by 2020, Lesotho will need major investments in urban water and sanitation services, particularly in the lowlands, which are home to 75% of the people. The analyses presented here provide decision makers in Lesotho with highly valuable information on how different strategies would affect water availability for different sectors under a wide range of possible future conditions. The results show how different strategies are likely to perform and affect water supplies within Lesotho and in the urban centres it supplies. Therefore, the process provides the tools to empower stakeholders to act with more confidence in the face of uncertainty. The modelling analysis of the river basin shows that climate change has significant implications for Lesotho’s future economic development and its ability to supply South Africa's urban centres. The WEAP model highlights the high vulnerability of the domestic and industrial water security under current climate conditions. However, it indicates that implementation of the lowlands project and other potable water supply infrastructure investments, along with the Polihali Dam, can reduce these vulnerabilities. Agriculture will remain vulnerable to variations in precipitation in the absence of investments into the development of irrigation infrastructure. However, projected development targets can be met without significantly reducing the reliability of transfers to South Africa. The analysis also shows that the highlands project can continue to reliably meet transfers to South Africa unless the climatic conditions become drier by 5% or more. Building the Polihali Dam will increase the potential transfers, and improve reliability. Full development of the highlands project will increase the transfer capacity, and would also support development of water supply and irrigation schemes in the lowlands. Continued development of the lowlands project is critical for the domestic and industrial sectors. Exploring the interconnections between the highlands project and the lowlands bulk water supply scheme could enhance resilience and balance the opportunities afforded through the regional transfer of water with national priorities. There are some important messages for decision-makers in all countries with an interest in the water resources of Lesotho from the assessment - that transfers to both South Africa and Botswana could be reliably met under future scenarios in which the climate is about the same as, or wetter than, historical trends. Under drier climates, there would be a trade-off between meeting the transfer targets for Botswana and South Africa. Cross-sectoral and stakeholder collaboration is especially important in areas in which interests and policies conflict and available resources are limited. What cross-sectoral or city-region issues and considerations are you aware of in your own city context and how are these being considered (or currently not considered) at the city level. What strategies are in place to address these issues? *Huber-Lee, A., M. et al. (2016). Lesotho: Tackling water insecurity in a changing climate. *The World Bank report describes how the WEAP model is used in a Robust Decision Making process.